Protekt 200 Pressure Redistribution Foam Mattress by Proactive Medical is an economical, multi-tiered pressure relieving mattress that makes a perfect choice for the prevention and treatment of bedsores and ulcers among hospital patients. 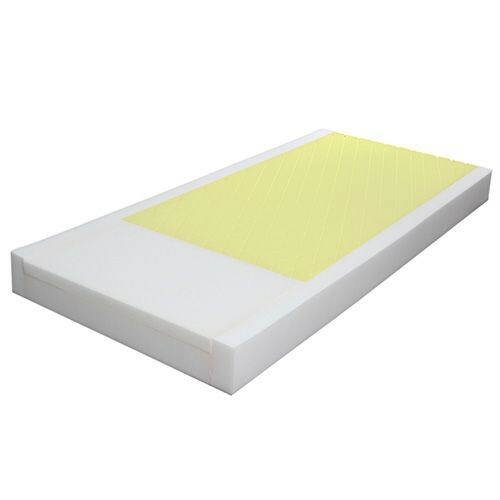 This unique multi-tiered mattress features a top layer of die-cut high density foam in the head and torso section which provides superior pressure redistribution for those who may be bed ridden or prone to spending long amounts of time in bed. Protekt 200 Pressure Redistribution Foam Mattress features a four-way stretch nylon top cover which reduces perspiration and provides low shear friction surface that is anti-microbial and water resistant, while the bottom layer is made of high density foam to provide a firm support base. It also features a PTSS Rail System to provide additional support, as well as facilitating patient transfers and edge of bed sitting. Vitality Medical also carries Tranquility ATN All Thru the Night Briefs and CareFor Deluxe Washable Underpads. Top Layer of Die-Cut High Density Foam In the Head and Torso Section Provides Superior Pressure Redistribution. Heel Section Is Multi-Tiered; the Top Layer Consists of Individually Responsive Cells For Superior Pressure Redistribution. Bottom Layer of High Density Foam Provides a Firm Support Base. Measurements: 36"x76"x6", 36"x80"x6", 36"x84"x6", 36"x76"x9", 36"x80"x9", 36"x84"x9"